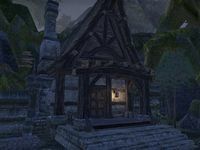 Cyrodilic Jungle House is a small player house in northeastern Baandari Trading Post. The house itself is comparatively smaller than most of its counterparts, containing one room with a fire place, but it has a large courtyard. To purchase it with gold, you must also complete A Friend In Need. This page was last modified on 25 November 2018, at 11:08.